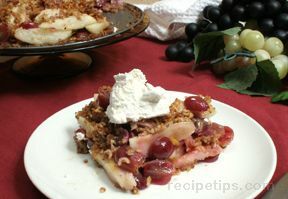 The flavors of sweet red grapes and juicy ripe pears complement each other so perfectly in this scrumptious dessert recipe. Preheat oven to 350°. Lightly oil springform pan. In food processor, place toasted, cooled almonds along with 1/3 cup sugar and salt. Pulse until finely ground. Add breadcrumbs and pulse to mix. Add in egg white and oil, pulse just until mixture is moistened but still crumbly. Press 1 1/2 cup mixture into bottom of pan. Bake for 8-10 minutes or until crust is firm, cool slightly. In large bowl, combine lemon juice, zest and 3 tablespoons sugar. Peel and quarter pears, remove cores and slice each into 4 slices. Place all in bowl with lemon mixture. Add grapes. Mix all to combine. Pour into baked crust along with juices from bowl. Top with remaining breadcrumb mixture. Bake tart for 35-45 minutes or until fruit is tender and bubbly (cover at the end with foil if browning too quickly). Cool in pan for 15-20 minutes. Loosen edges and remove pan sides. Serve warm or at room temperature with Cool Whip if desired.